With extensive testing both in Japan and the USA, this turbo kit was designed to enhance the overall performance for daily drivers and weekend racers. An ideal turbo sizing maintains the vehicles balanced driver feel, by maintaining good low-end response with the factory engine components. But the most noticeable improvements can be noticed on the factory power-band's dip in mid-range torque and at high RPM top-end power. GReddy dyno test showed a +93.5 whp / +68.7 ft/lbs increase at 7 psi on a stock 2013 Scion FR-S with factory injectors and fuel pump, just adding a *GReddy-tuned EcuTek ecu, and a *GReddy Evo3 70mm exhaust, - (*not Included) But even more importantly, the mid-range torque from 3150-4750 RPM's are significantly improved over the stock torque curve. 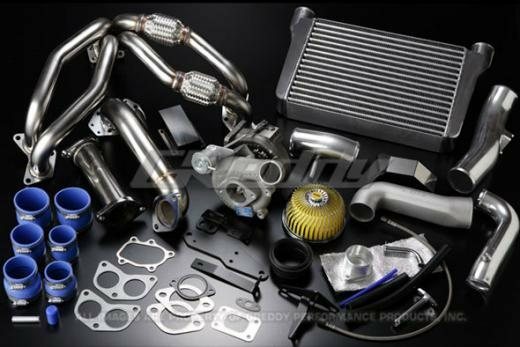 The Tuner Turbo Kit includes: a top-mounted GReddy T518Z 10cm2 actuator turbo on an equal length 4-1 SUS header-type exhaust manifold with dual flex joints, SUS downpipe and cat-delete, free- flow Airinx AY-SB intake, short-routing intercooler piping, Type-40E front-mounted intercooler with cast end-tanks and all the necessary brackets, heat-shields, hoses, clamps, and gaskets.